WHEN the master of Thai cuisine, David Thompson, moved to London to open his Michelin-star restaurant, Nahm (Thai for ‘water’), he left a void in fine Thai dining in Sydney. His landmark Sailor’s Thai at The Rocks is in safe hands but there is an absence of truly remarkable Thai restaurants – which is disappointing considering the legacy (and standards) Thompson left. Virat ‘Nu’ Suandokmai, the Executive Chef and owner of Nu’s (178 Blues Point Road, McMahon’s Point), comes from a lineage of competent and creative chefs that have hailed from Adelaide. Many Adelaide chefs have left Australia’s produce and wine capital to seek global recognition (and possibly fortune) in a highly competitive and unforgiving market. Philip Searle and Christine Manfield are just two Adelaide chefs who are running successful restaurants here in NSW. Nu’s is in an old stone house in the affluent harbourside suburb of McMahon’s Point, just down the road from the busy North Sydney CBD. With wooden tables, bentwood chairs and white-linen tablecloths (and even a chandelier), Nu’s has the air of sophistication expected of (and needed for) a fine-dining Sydney restaurant. Open for both lunch and dinner – Nu’s attracts North Sydney business mandarins, socialites and wealthy locals alike. 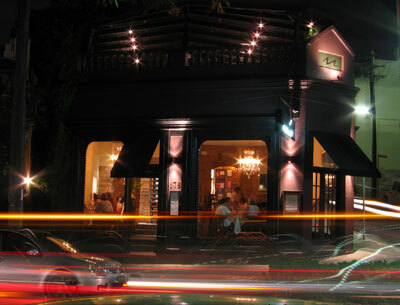 The restaurant prides itself on a modern interpretation of “Middle Kingdom Thai” (Middle Thai cuisine hails from the Ayutthaya region of Thai – the site of Thailand’s first royal capital and near where Suandokmai grew up) with Suandokmai using organic and chemical-free produce when available. A large specials blackboard offers a modest selection (determined by what is seasonally and freshly available) and complements the well-groomed menu. There is a special lunch menu for $19 (with a glass of wine) with a choice (six) of mainly what could be described as Thai street dishes (Thai omelette, pad see-il, beef noodle soup to name three). Not bad value for this type of restaurant considering mains can be up in the high $30s. My lunch party of four skipped entrées and shared the main courses. We selected two from the specials blackboard and two from the a-la-carte menu. The first dish was a special – the red duck curry served in young coconut with lychees and tomatoes ($38). At the centerpiece of the plate was a large hollowed out young coconut full of the red duck curry (with duck curry also scattered on the plate and surrounding the coconut). The roast duck was thinly chopped and the curry was fresh, rich and sweet (the young coconut milk adding a required but not overbearing sweet richness to the curry paste). The lychees and tomatoes (lychees, pineapple or tomatoes are traditionally used in duck curries to add some acid and sourness), aided in cutting through the mouth-filing duck meat and ensured that the fat of the duck didn’t become too heavy on the palate. Pad Thai ($25) is a Thai street food favourite. Nu’s pad Thai was true to the classic. It came wrapped in a egg “net” (the egg webbing totally encompassing the noodles). Once broken, the net revealed al-dente rice noodles tossed with large sliced pieces of chicken breast and firm tofu, eschalots, coriander, sliced chilli and peanuts – all flavoured by a delicate tamarind-based pad Thai sauce. Wedges of lime and bean sprouts accompanied the noodles. It was a large serving with the four of us able to have a second helping, and for some – a third. The Massaman lamb shank curry ($38) was truely superb. A large, braised lamb shank covered and surrounded by a refined and rich Mussaman coconut cream-based sauce. It sat on a bed of sweet potato mash. The flavours were earthy and nutty with the cardamon and cinnamon spiced sweet creamy sauce enriching the lamb which was falling off the bone. So popular was this dish with my dining companions another serving of rice (at $3.50 person) was needed to ensure that not a drip of sauce was left on the plate. The final dish was the Wagyu chilli stir-fried beef ($34). Thinly-sliced wagyu beef melted in the mouth. The beef was coated in a chilli jam sauce mixed with fine kaffir lime leaf and matchstick slices of chilli. The flavours were well integrated and it was a welcome dry dish to the two curries that we had. All in all a satisfying meal, however I thought it was cheeky we were charged 50 cents for the prik nahm pla (chopped chillies drenched in fish sauce – a staple in any Thai home or restaurant) which is used to personally adjust saltiness and heat when one eats. Charging for something as basic as this is like charging you to use the salt and pepper at a restaurant. Nu’s also offers a selection of ‘set menus’ from $50 per head up to $85 per head, as well as a ‘Thai tapas’ menu with a selection of bite-sized offerings (two per serving) from $9 to $12. Suandokmai is truly making his mark on Sydney and Nu’s is a satisfying and pleasant dining experience and is filling the void that Thompson left. The verdict: Contemporary Thai cuisine without being pretentious but staying true to traditional ingredients and flavours. Fills a needed gap in “fine Thai dining” in Sydney. Attentive but not obtrusive service. Decent and well-presented servings. Stylish but not over-the-top decor. Well worth a visit with friends or ideal for a business lunch. Ate there: Thursday, 18 March 2010. This entry was posted in Fine dining, New South Wales, Sydney, Thai and tagged Australia, Curry, Food, Noodles, Nu's, Sydney, Thai. Bookmark the permalink.